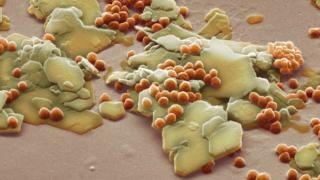 A worldwide ban on plastic microbeads in cosmetics should be imposed as soon as possible, MPs have demanded. Other microplastics result from the breakup of larger plastic objects in the oceans – like bags, bottles and discarded fishing gear. It is estimated that between 15-51 trillion microplastic particles have accumulated in the ocean. Microplastics from cosmetics are thought to constitute just 0.01% to 4.1% of plastics entering the marine environment. The tiny synthetic fibres used to make fleece jackets are also contaminating fish, the MPs have warned. One estimate suggests around 1,900 individual fibres can be rinsed off a single synthetic garment - with perhaps 40% of them evading sewage treatment works and ending up in the ocean. "We are absolutely committed to protecting the world's seas, oceans and marine life from pollution, and will take a detailed look at the recommendations contained in this timely report," a spokesperson for the Department of Environment, Food and Rural Affairs (Defra) said. "Many leading manufacturers have already taken voluntary steps to remove microbeads from cosmetics, beauty products and toothpastes. We will now consider what further action is appropriate, and make any announcements in due course."